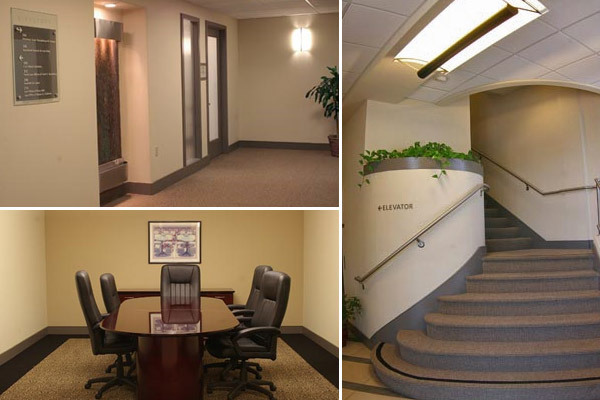 TFA designed interior tenant improvements for this older existing office building. Floor, wall and ceiling finishes throughout the ground floor lobby, portions of the ground floor tenant spaces and all of the second floor were replaced. Lighting was modernized and skylights were opened up at the second floor hallway. The lobby was updated with a more dramatic staircase, steel railings and a curved planter. A shared conference room and staff kitchenette and dining area were created and various building code and accessibility issues were resolved. These improvements in the building’s appearance and functionality allowed the owners to more effectively market the remaining leasable space.